Filmed at the Olympia Theatre in Dublin on 15th July 2014, this was the first time Daryl Hall and John Oates had played a live show in the city. They delivered a fantastic performance, packed with hits, to an audience who were clearly in the mood to party as only Dublin can! Though their chart-topping days reside far behind them, Daryl Hall and John Oates have enjoyed a bit of a comeback in their older years. With a recent induction into the Rock and Roll Hall of Fame and a lot of respect from younger hitmakers, Hall and Oates probably are as popular now as they’ve been in the last 30 years. We find the duo on-stage in Ireland for 2015’s Hall and Oates: Live in Dublin. Shot at the Olympia Theatre in July 2014, the pair play a slew of their hits as well as a smattering of lesser-known tracks. From 1973’s Abandoned Luncheonette, we locate “She’s Gone” and “Las Vegas Turnaround”. 1975’s Daryl Hall and John Oates offers “Sara Smile”, and 1976’s Bigger Than Both Of Us provides “Rich Girl”, “Back Together Again” and “Do What You Want, Be What You Are”. “It’s Uncanny” showed up on a 1977 compilation called No Goodbyes. With that we head to 1980’s comeback album Voices for “Kiss On My List” and “You Make My Dreams”. 1981’s Private Eyes continues the hit parade with the title song and “I Can’t Go For That (No Can Do)”. Off of 1982’s H2O, we locate “Maneater” and “Family Man”, while the 1983 hits collection Rock ‘n Soul Part I features “Say It Isn’t So”. Finally, we discover “Out of Touch” from 1984’s Big Bam Boom. I loved Hall and Oates back in their early-mid 80s heyday, and I still enjoy their material decades later. I saw them live in their prime a handful of times and thought they put on great concerts back in the 1980s. However, I felt less excited with more recent experiences. I’ve gone to a few Hall and Oates shows in the 21st century and thought these concerts were distinctly, decidedly, wholly… okay. Hall and Oates put on perfectly competent performances but never did more than that, so the shows felt a little on the perfunctory side. Does Dublin rise above that level? Nope – it gives us a professional concert but not anything more than that. Once a thing of beauty, Hall’s voice has deteriorated over the years. Of course, some of that seems inevitable; it’s tough to find performers in their sixties who still sound like they did in their twenties and thirties. That said, Hall’s vocal decline seems more pronounced than most, perhaps because he had such a remarkable voice in younger days. I don’t want to leave the impression that Hall can’t sing at all or that he now boasts a Dylan-style croak - indeed, he manages some decent leads at times. Still, it can become somewhat painful to hear a one-time amazing talent strain and struggle so hard to make it through these songs. Hall’s vocals usually remain acceptable, but they don’t hold up as well as one would hope. As for the overall performances of the songs, they seem fairly lackluster. To some degree, I find it hard to fault Hall and Oates for this, as they must be damned sick of playing these songs. However, scores of older bands deal with the same issue and manage more pep and vigor when they play those golden oldies for the kabillionth time. Hall and Oates look a bit more bored with the hits than their peers, and they comes through via these somewhat mediocre renditions. Even though they alter the arrangements, the overall impact remains less than enthralling. Back in the 80s, Hall and Oates boasted a lively band, but that no longer seems to be the case. Oh, the musicians show more than adequate talent, but they always feel like “hired hands”. Sax player Charlie DeChant remains the only holdover from the old days, and the anonymous sidemen with him can’t add much flair to the proceedings. They play their parts, stay in the background and fail to make an impact. Is it fair for me to criticize Hall and Oates because they’re no longer as good as they were 30 years ago? Maybe not, as it’s unreasonable to expect older acts to maintain the same vitality they boasted in their youth. However, I go to a lot of concerts, and most involve performers as old or older than Hall and Oates. I don’t leave those shows with the same level of disappointment that I encounter here. I’d love to see a concert video from the 80s and would snap that up in a heartbeat. Circa 2014, however, Hall and Oates put on a less than scintillating concert. 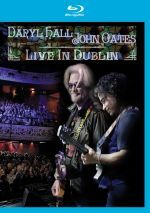 Hall and Oates: Live in Dublin appears in an aspect ratio of approximately 1.78:1 on this Blu-ray Disc. This became an appealing presentation. Most of the color variation came from lighting, as Hall, Oates and the musicians all sported dark clothes. With some blues, reds and purples, the hues looked well developed and accurate. Blacks were deep and dense, while low-light shots came across as clear and appropriately visible. Dublin wasn’t the most attractive concert video I’ve seen, but it nonetheless seemed quite positive. As one expects from a live performance presentation, the DTS-HD MA 5.1 soundfield remained focused on the front, where they showed strong stereo imaging. Lead vocals appeared firmly set in the middle. The instruments were accurately located and they demonstrated nice breadth and delineation. I could distinguish the various instruments with ease, as they were placed in a natural and clear manner. They also blended together smoothly to create a forward soundstage that consistently created a real and involving setting. Audio quality was solid. Vocals worked fine, as they replicated the desired impressions well. The rest of the track also showed good clarity and a fairly dynamic tone, as the instruments remained crisp during the concert. At times I thought bass response could’ve been a little deeper, as the track was marginally thin during some tracks. This wasn’t a true issue – more of a preference – so it didn’t detract terribly from the presentation. Taken as a whole, the audio seemed satisfactory. Under Interviews, we find two segments: “The Band” (7:04) and “Dublin Calling” (7:09). In the first, Daryl Hall and John Oates tells us how amazing their musicians are, and in the second, we learn how great they are as a live act and how wonderful it is to play Dublin. They tell us virtually nothing of substance. Finally, the set delivers a booklet. This offers photos, credits and a short essay about Hall and Oates. It’s a minor addition to the package. If you hope to find top-notch Hall and Oates from Live In Dublin, you’ll encounter disappointment. While professional, the performance lacks much spirit and seems fairly lackluster. The Blu-ray brings us very good picture and audio along with some minor supplements. I enjoy Hall and Oates but don’t see myself revisiting this Blu-ray anytime soon.